Hotels can now offer organizers of Weddings, Groups, Meetings and Events a dedicated website, known as a Group Page, where they can self-manage their group block and collaborate with their guests. Group organizers, particularly for weddings, expect and demand the ability to manage their group online and with Groupize Pages we can meet and exceed their expectations. Groupize Solutions, the leading provider of group booking technology for hotels, announced today the launch of their new Groupize Pages product with a free 90 day trial. 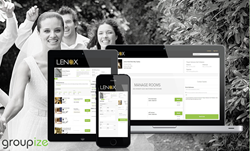 Independent hotels, resorts and chain hotels can use the solution to create unique customized pages for organizers and attendees of weddings, meetings, groups and events to self-manage their room block online and via mobile devices. A dedicated group page is available for all groups booked in the hotel’s CRS, regardless of size of group or booking channel. A sales manager can create a dedicated group page in just 15 seconds for any group. The organizer instantly receives notification and from their desktop or mobile device, they can manage their block, invite guests and update payments without delay. The ability to manage their group online impresses organizers by eliminating the need to contact the hotel by phone or email with any updates. All updates made online are incorporated into the hotel’s system via a two way connectivity to the CRS, also relieving sales staff from many of the time consuming post booking details. Group organizers can invite their friends by email or text. Invited guests can register, select their room, provide payments, add additional guests, add special requests, make modifications or release their rooms online via desktop or mobile device. Hotels can utilize the Groupize Pages product to send communications to the group including reminders, alerts and promotional messages. The solution also sends a courtesy rooming list to the hotel, although all the reservation information is already populated in the CRS without any re-keying, and it can auto-cancel rooms that have not been picked up. Hotels utilizing the unique platform differentiate themselves by offering cutting edge technology that enhances guest experience and satisfaction, while drastically saving time and costs associated with post booking needs. In the Groupize Pages mobile version, from the palm of their hand, organizers can share photos, agendas, event descriptions as well as email or text hotel. The enhanced version also integrates into other collaboration apps such as apps from select wedding web sites. Millennial brides and organizers of social groups are inherently dependent on mobile and want solutions that match the way they want to interact. Using Groupize Pages, hotels can now give them the tools to interact in the way they are accustomed to. “Independent hotels that historically have not had access to technology like this will benefit the most from Groupize Pages,” adds de Gaspe Beaubien. The newly added product is the fourth solution in the powerful Groupize Suite, which enables hotels to better manage their small groups and meetings, a growing market segment that already accounts for 20% of their business on average. The Groupize Suite is compromised of the Groupize GBE (Group Booking Engine), Groupize PRM (Pipeline Response Manager), the Groupize Network and now Groupize Pages.